Hey, that tastes good! 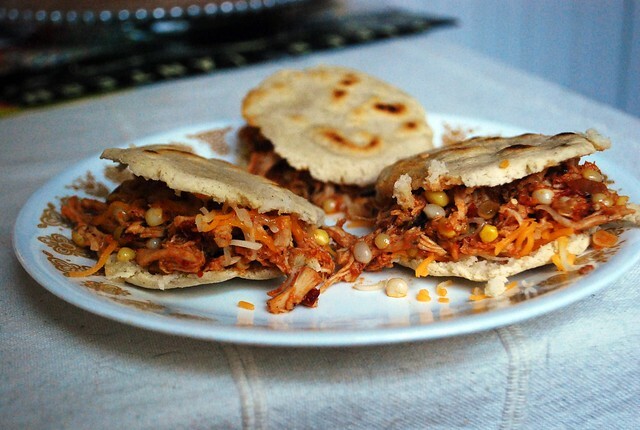 : Arepas with chicken and corn! Arepas with chicken and corn! Hi everyone. I've been busy lately, working and working on the house. I hope you are all having a great summer! Today I made kind of arepas. I say kind of because I used the wrong kind of flour, but they're delicious anyway. I ate them. I filled them up with cheese and corn and chicken and deliciousness. In a large bowl, combine masa and water and oil and salt. Mix with your hands, until a smooth dough forms. Preheat a lightly greased griddle pan over medium heat, and turn the oven on to 350. Roll the dough into balls and flatten them with your hands (this is a really good tutorial) then press onto the griddle. Cook about 5 minutes on each side, until firm and lightly browned, then finish in the oven for 15 minutes. The inside will still be a little sticky, that's ok. While the arepas are cooking, make the chicken. Combine the chicken, salsa, chipotle and corn in a pan and cook over medium heat until heated through. 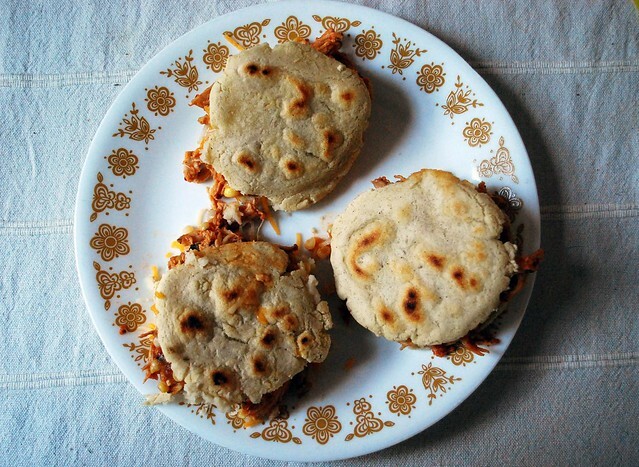 Once the arepas are done, slice them in half like a sandwich and stuff full of chicken. I sprinkled cheese on top before I closed them up again. Makes about eight. I have some Venezuelan friends and anytime she asks me what I want to eat, I usually say something about Arepas! Authentic ones are amazing. I'd never had them until I met her! She taught me how to make my own—which aren't too bad, but my family won't eat mine, only hers. She also makes this other amazing dish that I can't pronounce and can't remember. It doesn't have any gluten in it. She always makes a nutfree batch for me when she prepares it as I'm allergic. It's some traditional meal that is prepared around Christmas and they make like 100 or so as a whole family and freeze a bunch. Now my mouth is watering—too late & early to eat!